Vinny Arkins has led the club to impressive results as interim manager. Pic by PressEye Ltd.
Portadown’s Board of Directors will meet early next week to finalise a shortlist of candidates for the role of first-team manager. Vinny Arkins is serving as interim boss but does not, at present, hold the UEFA ‘A’ Licence coaching qualification required to take up the position on a permanent basis. Club officials have 60 days from Pat McGibbon’s resignation on October 14 to fill the full-time vacancy. “We will sit down at a meeting next week to discuss all options and the intention is to then move quickly forward,” said director Peter Hunniford. “We are well aware of time factor given the 60-day rule. “A number of parties have come forward to declare interest and the plan is to meet and establish a shortlist of suitable candidates. 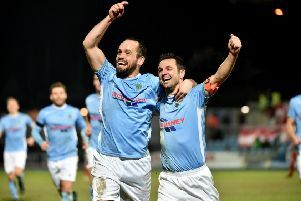 Arkins stepped up from a role as assistant to McGibbon following last month’s change and the former Ports captain has enjoyed an unbeaten run as interim boss on the pitch - with wins over Ballinamallard United and Ards, plus a weekend draw at Glentoran. The Ards result was ruled out by the Irish Football Association disciplinary committee due to Robert Garrett’s ineligibility. However, officials have made public thanks to Arkins and the management team of Trevor Williamson and player/coach Keith O’Hara for bringing on-the-field stability.